Among the most arresting aspects of Maria Tomasula’s work is the refulgence—“magic realism,” as some critics call it—of her technique. Meticulously rendered flowers, berries, beads, twigs, rodent skulls and bone fragments fairly swell and glow as they bulge from the painted wooden panels so vividly that even a forerunner like Georgia O’Keefe might look twice, and approvingly, at them. These commonplace objects are often so anomalously arranged in her widely viewed and reviewed oil paintings that the assortments invite a reverent attention, much as religious icons are able to do. Something like this seems to have occurred to the members of a committee which early last year began searching for an artist to paint a new version of Our Lady of Guadalupe for an eastern apsidal chapel in Notre Dame’s Basilica of the Sacred Heart. The committee members were Gilberto Cardenas, director of the Institute for Latino Studies; Rev. Austin Collins, C.S.C., professor of art; Charles Loving, director of the Snite Museum of Art; Rev. Peter Rocca, C.S.C., rector of the Basilica; Rev. Richard Warner, C.S.C., director of campus ministry; and John Zack, University sacristan. When they proposed the idea to Tomasula, the Michael P. Grace Professor of Art, she didn’t take long to accept. A natural candidate for the job, she already had drawn deeply on Latin American iconographic tradition for much of her earlier work, and, besides, as the proud product of a Spanish speaking family and neighborhood in Chicago, she had been affectionately familiar with the Guadalupan image from earliest childhood. That image, emblazoned by miracle or mystery on St. Juan Diego’s tilma, or cloak, enshrined in the Basilica of Guadalupe in Mexico City and widely venerated since the 16th century, is ubiquitous throughout the Americas. As if in illustration of Father Elizondo’s theological point, the image shows up on votive lights, keychains, automobile ornaments, advertising circulars and jailhouse tattoos. A camp guest of some Marxist guerrillas during the civil war in El Salvador once noticed that one of them had lovingly carved a likeness of Our Lady of Guadalupe into the stock of his Kalashnikov assault rifle. Aware from the outset that she, no less than these variegated devotees, would be constrained by the authority of tradition, Tomasula began to sketch and to share her sketches with the committee, which constrained her barely at all. She finished her work in time for it to be installed Dec. 12, the Feast of Our Lady of Guadalupe. noticeable in the face of the angel beneath Mary’s feet, arms upraised in adulation. As is theologically appropriate for so famous an icon of Marian devotion, this is an impressive instance of a mother and her children doing well by one another. 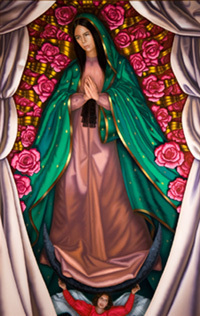 Another careful departure from the traditional image is seen in a sea of scarlet roses which roils like volcanic lava behind Mary’s figure, recalling the roses which had grown through rocks on the hill at Tepeyac, and which the Nahuatl-speaking young lady of his vision had bid Juan Diego gather up in his tilma before she left her image there. Recalling the sunburst of the tilma’s image, Tomasula has golden bands coiling through the nearly explosive roses, a futile metallic cordage to bind a wild and preternatural arrangement of flower and flame, reflecting a harsh and brilliant light. It’s not difficult to imagine Athena emerging from just such numinous light to accost Odysseus, giving that ancient hero the heart and courage he would need to contend with and prevail over the perils of his homecoming. But Athena is merely a goddess. This pregnant teenage mestiza, shown here so wonderfully emerging from the rock, flower, flesh and blood of our own world is already God’s mother. Ours, too, if we but consent to the adoption.